" Articles in Category: Lawrence Lessig	"
On today's BradCast, the power of protest and organization. We start at the University of Missouri after African-American players on the football team there used their power over the weekend to collectively and courageously support a student hunger strike in a protest to force university system President Tim Wolfe to resign amidst a series of racially charged incidents on the Columbia, MO campus. The leverage used by the players is another great reminder of how smart and courageous protest can succeed in making substantive change --- even against some of the world's most powerful entities. Go Tigers! Speaking of which, my guest today is, once again, Douglas Hughes. You may recall him as the 61-year old Florida postal worker who landed his homemade gyrocopter on the West Lawn of the U.S. Capitol in a dramatic protest last spring. He was our guest back in April, just days after the incident where he had hoped to bring attention to the desperate need for campaign finance reform. He was, at the time, arrested and charged with six felonies that might have netted him more than 9 years in jail for his attempt to deliver an important letter to all 535 members of Congress. Now, he has struck a plea deal with federal prosecutors and joins us to discuss the deal, why he took it, the latest developments in his case, and whether he feels his protest was ultimately worth the extraordinarily high cost. Hughes tells us today that he has "no regrets" for having "stomped on the dragon's tail", despite losing his job at the Post Office, facing enormous fines, jail time, and even the loss of his ability to vote as a "felon". "I stomped on the dragon's tail and I knew it was going to turn around and come after me," Hughes tells me. "And it has, and I have no regrets." He credits the flight with helping to broaden the discussion about the need for reform, and says, despite the extraordinary cost, he'd do it again "in a heartbeat" as he continues his call for a "voters rebellion" to help "get the money out of politics so everybody that's in Congress knows they've got to answer to us." Though Hughes was reluctant to mention it, he has a GoFundMe page where folks can donate to his legal defense fund and other needs as he is now struggling to survive day-to-date until his Social Security finally kicks in. Please consider helping him out if you can! 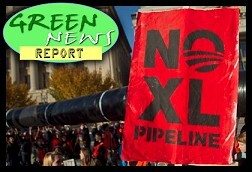 IN TODAY'S RADIO REPORT: First-ever hurricane for the nation of Yemen; Hillary Clinton comes out in support of an investigation of Exxon; Record warm oceans blamed for the collapse of Maine's cod fishery; PLUS: TransCanada calls time out on its controversial Keystone XL pipeline... All that and more in today's Green News Report! 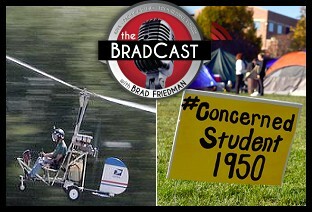 Election Day is tomorrow in several states and many more local jurisdictions, but on today's BradCast, we've already got our first "irregularity". My guest today is John Brakey, a longtime Election Integrity advocate from Pima County (Tucson), AZ. Last week, he caught an election official --- on video tape --- breaking the security seal on the county's new, central vote tabulator after party observers had left county election headquarters following pre-election "Logic & Accuracy" testing of the system. "I looked at my screen,and I go: 'What is that guy doing? What's he doing over there? He's just opened the box up. Where's the Democratic observer?! Where's the Republican observer?! '," Brakey tells me about the incident on today's program. He goes on to explain what happened, how he caught the guy, what the county did about it, and how you may wish to be concerned about the possibility for similar corruption with similar electronic systems in your home town. Thanks to Brakey, the incident led to new L&A tests the next day, though the explanation for the entire affair from Pima County Election Director Brad Nelson (the original "Election Official Gone Wild", as seen in this 2006 video tape), remains questionable --- particularly since Nelson was in the room at the same time his subordinate was seen breaking into the system. We sought comment from Nelson, but he has yet to respond to our request. For the record, Brakey is one of the stars of J.T. Waldron's riveting 2009 documentary film, Fatally Flawed: The Pursuit of Justice in a Suspicious Election which tells the remarkable --- and, at times, uplifting --- story of the years-long fight by Brakey and a transpartisan coalition of others in Tucson to obtain a recount of ballots from a questionable $2 billion 2006 bond initiative election in Pima County. 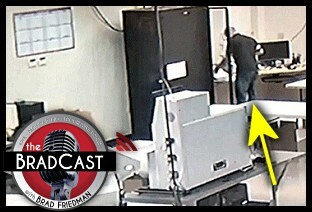 Today's BradCast is packed with news from top to bottom. Please buckle up before listening. First, Big Oil's deceptive scam in California (as discussed on yesterday's show) has succeeded, for now, as Dems pull landmark legislation that would have called for a 50% cut in petroleum usage in the state. Then, new polling finds Bernie Sanders overtaking Hillary Clinton now in Iowa, as well as New Hampshire, while the party's internecine battle over more debates continues. On the GOP side, candidates not named Trump are flailing as they desperately try to get attention. It's not working --- neither is their lost hopes of scuttling the Iran peace plan. Next, author and national security correspondent Shane Harris joins us to discuss his disturbing new exclusive at The Daily Beast on 50 U.S. intelligence analysts now reportedly charging that the U.S. has been "cooking" its intel on ISIS. The still-unnamed military intelligence analysts working for CENTCOM, as Harris explains, are reportedly seeing some of their own reports manipulated by higher-ups. "Key pieces of [their analyses] that they feel are very important [are being] taken out, not given the proper context, [and] in some cases making it look like ISIS and al Qaeda are weaker than these analysts actually believe they are." So are these charges akin to the way intel on Iraq and WMD was manipulated by the Bush Administration in the 2002/2003 lead-up to war, as revealed by the notorious Downing Street Memos ("the intelligence and facts were being fixed around the policy")? Or are these claims more akin to the hyperventilation over unsubstantiated allegations from the Right concerning Benghazi? Harris tells me his reporting suggests it is more likely the former than the latter, though it remains unclear who is behind the alleged manipulation of intel and how high up it might go, even if proven true. "What I think is notable is that these 50 --- actually 52 --- professionals who are doing this every day, to go against their bosses, to take this to the IG is a very bold move. They feel very strongly that they have a case," he explains. "I've never seen anything like this. Usually whistle-blowers are in ones and twos, but for a group of people en masse to complain like this is certainly unique in my experience as a reporter." 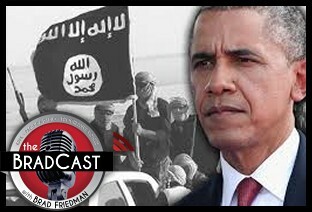 We discuss who may be behind the alleged "cooking" of the intel and whether President Obama or the White House is somehow directing all of this as the Bush/Cheney Administration was doing in the case of the manipulated intel on Iraq. Tune in for Harris' response to those questions and many others, in what seems, at least as of now, a startling, if still-developing story.